The memory is as clear as day: the train is surging along the tracks and through its curtained window I can see the landscape flying past in a blur of dun-coloured pastures and swaying grass. My little sisters and I stand at the window and stare out at the passing world. The youngest is not yet two, and though she will grow to be six feet tall one day, for now she must stand on tiptoes to take it all in. We see children running beside the train, laughing and waving. My mother opens the windows; fresh air surges into our compartment, blowing our hair back and stinging our eyes. She finds the sandwiches left over from yesterday's lunch and throws them to the children. My sisters and I watch, transfixed, as they come to a halt and scramble about in the dirt for our gifts, tightly wrapped in grease-proof paper. The train chugs on, and the children shrink to specks on the horizon. The sound of the train floods the compartment now, hot metal wheels gripping a hot metal track, the repetitive forward lurch reassuring us of progress — from the Goldfields of the Transvaal to the flat expanses of maize fields in the Orange Free State to the haunting, empty space that is the Cape's Karoo. That very first train journey came to mind last week as I travelled by rail from Singapore to Bangkok on Belmond's Eastern and Oriental Express. As we crossed the Johor Causeway from Singapore into Malaysia, it struck me that the railways lines that cut through the countryside can also underscore the divide between rich and poor; no matter how elegant the train, class disparities and the struggles of daily life cannot be shielded from the passengers who travel on them. Railway lines take the path of least resistance and the routes of most gain, and so they bring us right up close to the people who live alongside them. Sitting in our beautifully-appointed compartment, crossing from Singapore onto the isthmus of mainland Malaysia and the protuberance of southern Thailand, we are given a unique insight into the lives of the people whose countries we are passing through. We can watch them tending their vegetable plots, hanging up their washing, nursing their babies. We can see how they make their living, harvesting endless rice paddies, baking bricks, sorting through scrap metal. We can peer into the windows of these people's homes, seeing for a fleeting moment the very heart of their lives. Though my earlier journey was of the budget variety — soggy sandwiches for lunch, shared toilets, fights over who would sleep on the top bunks and a memorable bout of vomiting as the train lurched and swayed in the middle of the night — it had highlighted my own privilege by drawing me far closer to South Africa's poor and marginalised than my safe, white existence had previously allowed. As the children ran beside the train we had caught one another's eyes. They were barefooted, the soles of their feet immune to the stony ground upon which they ran. Up close, I could see that their clothes were ragged, their skin dusty. Their huts were arranged in clusters off in the distance. It was so different an existence from my own. Today, rail travel is mostly reserved for the poorer classes. The rest of us take planes. But there is something that is lost in this age of air travel: an understanding of how railway lines have transformed many countries from subsistence communities into export economies; an opportunity for connections to be made between communities living along railway lines and the travellers who pass their way. 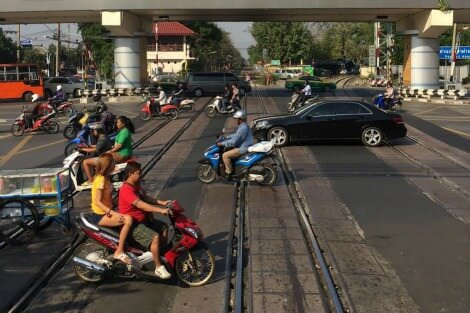 Last week as we reached the outskirts of Bangkok, we could see a city that had crowded in around the steel arteries connecting it to its furthest outposts and to towns and villages in neighbouring countries. People crossed casually from one side of the tracks to the other in the train's wake; dogs ran alongside us, tails wagging; houses stood beside the tracks, undeterred by the daily schedule. Though we were travelling in style, it seemed to be the most democratic, the most honest way in which to greet this city, like being welcomed into an acquaintance's home through the back door. Catherine Marshall is a Sydney-based journalist and travel writer. She was a guest on Belmond's Eastern and Oriental Express. The reference to your mother throwing food from the train to children, reminds me of the time when as children my brother and I would stand alongside the railway in Drouin and shout "PAPERS' at the passing passenger trains. Saturday evenings were most important as we would get sport results from the Melbourne Herald and Sporting Globe. Occasionally we would have to hunt for the papers, but mostly they were tightly folded and easily accessible. A wonderful description of train journeys and the human connections they deliver us. I thoroughly enjoyed your article Catherine. It reminded me how much I enjoyed my journeys by train in India and the contrast with those in England and Spain.last year. I especially liked your comment about the division between rich and poor. So true but perhaps nowhere so apt as the Toy Train iin Darjeelng which passes centimetres from front doors spewing thick black smoke as it toots its way loudly through streets and countryside. Very nicely written Cath, Well done. I like the way you bring yr first journey into the story. The older we get it becomes more obvious I suppose, because we can. It provides a necessary context. It was those Rwanda and Somalia stories, inevitably accessed by the Nairobi 'safari' hub, that got me writing travel in the first place. I need to start again. Many Americans want a President who speaks to their deepest dreams and ideals. A champion. Trump's vision of reality is the polar opposite of Obama's, a hellscape where foreigners, the unemployed (and women) are eroding society. But, like Obama, he has positioned himself as a champion of those filled with frustration, insisting it doesn't have to be this way. Bernie Sanders is in many ways the Trump of the left, a political outsider who says what progressive Americans have long been thinking.